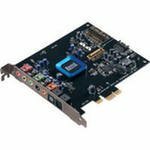 Creative PCIe Sound Blaster 5.1 Recon 3D - this sound card with a four-nuclear processor Sound Core3D. Technology THX TruStudio Pro allows you to achieve the incredible realism of the audio and surround sound effects on the speakers and the headset. Connection interface PCI Express. Bit depth of 24 bits and the maximum frequency of the DAC 96 kHz.